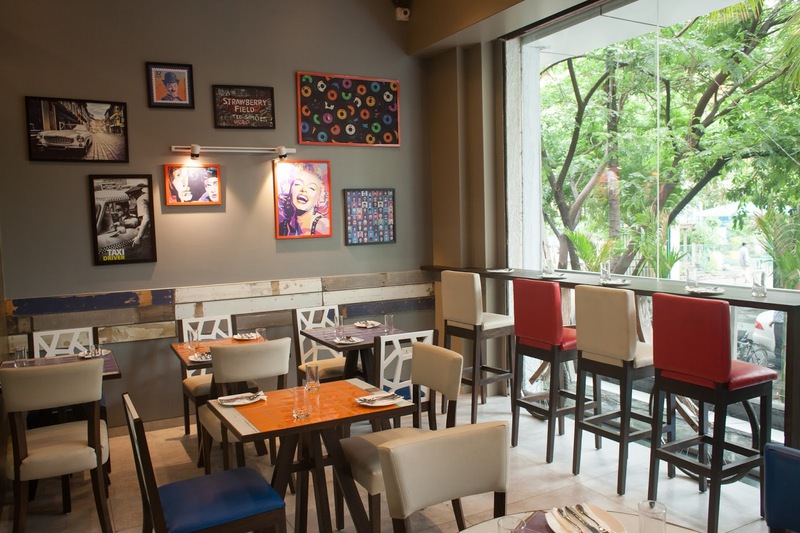 Simple flavours and honest food define this new feather in Koregaon Park’s edible hat. Ranbir Batra, a fourth generation restaurateur sets foot into Pune’s food firmament with his new 50 seater American-style bistro Frisco. He’s let his chef Sourabh Kulkarni take the reigns and the menu is a labour of his love for simple fresh flavours and thorough research – he knows what the city’s diners aren’t getting to eat at existing restaurants and aims to fill in the void with his offerings. Pune born and bred, Kulkarni has previously worked in hotels going from being primarily a pastry chef to being a commis, a garde manger, holding rank in every possible wing in the kitchen. We let him present his recommendations on a platter to us. We started off our meal with a Smoked Salmon Tartare (Rs 290), a dish he proudly claimed we won’t find anywhere else in the city. The tartare was a celebration of smoked salmon, sliced and tossed with diced cucumbers, dill, black olives, cherry tomatoes and avocados, lightly seasoned with olive oil and lime juice. The tartare was a light dish with healthy and fresh ingredients boasting of tangy citric notes. We ordered Thai Iced Tea (Rs 90), a chilled glass of perfectly sweet milky Thai tea with lemongrass and vanilla undertones in every sip. Upping its presentation was fresh lemongrass as a stirrer. The chef then laid out the Green Wok Salad ( Rs 250) before us. It would be little exaggeration to say it was a plated garden of sorts. The salad had iceberg lettuce tossed in olive oil, lime juice, black pepper and salt. There were also blanched asparagus, broccoli, crunchy green beans, sweet carrots and juicy peas alongside finely sliced radishes, pomegrenates and slivers of yellow and red bell peppers upping the color quotient. Adding a signature touch to the dish, the Chef also stained the platter with three different dressings – honey lemon, balsamic vinegar and mustard honey, giving you the option of enjoying an additional serving of the dressing of your choice. We accompanied this with a glass of Hibiscus tea (Rs 90), a beautiful magenta colored herbal tea infusion served cold, making this a good beverage choice for the health-conscious. From light and fresh to heavy and cooked, we treated ourselves to the Chicken Leg Confit (Rs 350) wherein the meat was marinated a day prior with onion, garlic and thyme and then slow cooked in its own fats in the oven for hours. Evidently the meat pulled off the bone effortlessly and was tender and flavourful. The honey mustard sauce paired very well with the chicken and the drizzle of balsamic vinegar brought in a flavour contrast and elevated the look of the dish. Making this a balanced dish were grilled bell peppers and zucchini which were drenched in caremalized juices from the meat. Kulkarni also served us a bowl of Vinizo (Rs 320) which was farfalle cooked al dente in a light creamy white sauce piqued with black pepper and characterized with crunchy toasted walnuts, juicy button mushrooms, dried thyme and pork ham. We wiped clean the bowl in a matter of minutes! The last dish Apple Pie (Rs 170) turned out to be a dampener. The pastry was doughy and did not taste fresh and the apple cinnamon mixture was a tad too sweet and dry. You can however choose to order ice cream as an accompaniment to this dessert. 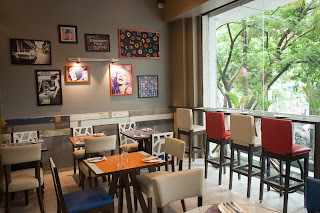 The interiors of the bistro are colorful and vibrant but not much to talk home about. The dishes are very reasonably priced. They serve all-day breakfast till 7pm. A soon-to-open bar right next door does not worry them and they do not intend to serve beer or wine. It’s all about the food at Frisco and they trust the culinary prowess of their chef will get their covers going; they already boast of repeat guests within the first week of operation. Their daily chef specials also promise to be a treat for diners.